"Try substituting macadamia nuts for pistachios." Grease and flour one large baking sheet. Finely grind the almonds with the flour, ginger and baking powder in a food processor. Beat the butter, brown sugar and white sugar until light and well blended. Add the grated orange peel, egg and vanilla and beat well. Mix in the dry ingredients and beat until just blended. Stir in the pistachios. Divide the dough in half. Using floured hands, roll each half on a lightly floured surface into a 1/2 inch log. Arrange logs on the prepared baking sheet, spacing 4 inches apart. Cover with plastic wrap and refrigerate for about 1 hour. Preheat oven to 350 degrees F (175 degrees C). Brush dough logs with beaten egg and sprinkle with 2 teaspoons white sugar. Bake logs until deep golden brown and firm to the touch, about 30 minutes. Let logs cool for 10 minutes. Reduce oven temperature to 300 degrees F (150 degrees C). Using a serrated knife cut logs crosswise into 1/2 inch thick slices. Arrange sliced cut side down on baking sheet. Bake at 300 degrees F (150 degrees C) until deep golden on top, about 12 minutes. Turn biscotti over and bake other side until deep golden, about 12 minutes. 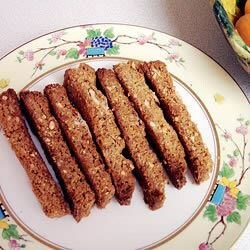 Transfer biscotti to a rack and cool completely. Store in airtight container at room temperature. What's cooking in Delaware, Ohio? Jessica's delicious homemade biscotti. When I baked this recipe, the loaves flattened out and ran into each other. Too much butter? I continued the best I could, and it really still tastes great. As the picture shows, the two rolls do flatten out, but can be cut into "fingers." This recipe is delicious and was rated "wow" by my Italian cousin-in-law. These are my all time favorites!! the really wow friends and family. I used macadamia nuts instead of pistachio. Yummy! Can you substitute ground fennel seed for the liquid anise flavoring?